Side view of the Mark III printer showing the supply reels at the top and the take-up reels at the bottom. The closed reels are for the raw stock and the open reels are for the negative. The circular pulley in the center is the heavy flywheel on the printing drive to insure smooth motion. After our discussion of the Mark III Printer on July 11 , I promised to write up a description of the principle which distinguished it from the earlier Mark II model. The incentive for developing the Mark III was primarily to get increased printer speed and hence print output. 3) increase printer slit width. The light source problem was being considered but tungsten lamps were the only practical solution at the time and were already being used at maximum brightness levels. The printer lens speed was already at the borderline of adequate image sharpness and no substantial increase seemed feasible. This left only the printer slit width. Printer speed being directly proportional to slit width indicated it would be desirable to find some way to increase this by a factor of two or more. In the Mark III the slit width is limited by two things: 1) for anything but zero "droop" correction, the image of the negative does not coincide with the print film at all points but rather it intersects the print film at an angle which increases with increasing "droop" and which is equal to twice the bridge angle (i.e. angle of incidence of light on print film). This means that the image is in focus on the print film at only a single line and thus a given point on the negative is in focus only during the instant it crosses this line. On either side of this line it goes out of focus to a degree depending on the distance and on the angle. For a droop corresponding to the requirements of a theater like the Rivoli, the bridge angle is about 45° and the image makes an angle of 90° with the print film. In this case a slit width of about 0.010 inch is all that can be tolerated, before image blur becomes objectionable. The other factor that limits the slit width is the amount of transverse motion of any given image point (especially near the edge of the picture) due to the change in magnification resulting from the oscillating lens. This change in magnification is necessary to produce the corrections for keystoning in the theatre (K-correction) and for vertical line curvature from the camera lens distortion (A-1 correction). 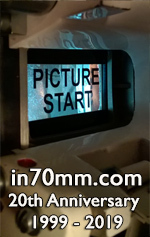 For the case of K-correction alone, the transverse motion at the edge of the film occurs at a rate of almost 1/5 that of the longitudinal motion picture and hence a slit width of 0.010 inch allows a transverse blur of about 0.002 inch multiplied by an additional factor because the effective slit width is increased by the oblique incidence of light onto the film print. The addition of A-1 correction aggravates this transverse blur still further, particularly in the upper corners of the frame. Benny Grinsewitz focusing the optical system. In the Mark III printer the optical system has been modified so as to eliminate both the blur due to the angle between image and print film and the transverse blur due to K-correction. The first of these was accomplished by replacing the Amci (90° roof type) prism at one end of the bridge by a regular 90° prism identical to the one already being used at the other end of the bridge. In this way the image and the print film were caused to coincide at any bridge angle, neglecting for the moment the curvature of the negative over the guide rollers and the curvature of field of the printer objective lens system. Both of the latter are far less important in causing blurring of the image than certain other effects. This change in the optical system by itself, without the oscillating lens action, would cause a transverse blurring which is comparable to that mentioned previously since, in this case, the instantaneously-formed image on the print film is itself keystoned. Thus the image of any off-center point on the negative does not travel parallel to the print film during printing but at an angle which increases towards the edge of the film. Here then lies the crux of the Mark III principle. By introducing just the right amount of opposite transverse motion for each point of the image using the oscillating lens, it is possible to compensate this "intrinsic" keystoning and eliminate this source of blurring. Now at the same time this will produce the desired overall keystoning of the image of the frame on the print film because as each elemental horizontal strip of the negative passes over the printer slit, it will be magnified by a different amount due to the oscillating lens just as in the Mark II printer. In summary, therefore, the Mark III makes it possible to print a keystoned, drooped image using a substantially wider slit. The A-1 corrections however, again cause some transverse blurring which now is most noticeable in all corners of the frame. This together with the curvature of the negative and the curvature of field of printer lens (which unfortunately add to one another, rather than cancel) now limit the slit width. Printing section showing on left the negative slit illuminated in straight line & on the right the print stock on the curved shoe & slit illuminated with a curved line (The B, or “Droop” correction). When the Mark III was tested in actual printing operation it was found that a slit of 0.030 inch or three times the Mark II could be tolerated at a bridge angle of 45° and about 0.040 inches at a bridge angle of 38°. Thus factors of 3 to 4 in speed could be realized, other things being equal. Actually various other changes particularly in the light source optical system were made which make a direct comparison invalid. The problem of obtaining any given overall frame keystone correction (K-correction) along with any given droop while at the same time matching the "intrinsic" printer keystone requires the control of several factors in the printing system. The focal length of the printer lens and the bridge angle determine the intrinsic keystone. The curvature of field of the printer lens and the bridge angle determine the droop. The overall frame of K-correction is a function of the shape of the cam which drives the oscillating lens and must be such as to compensate the intrinsic keystone. Thus for a given K-correction and droop it will, in general, be necessary to specify the printer lens focal length, the bridge angle, the cam design and the curvature of the print film guide or "shoe" which curves the print film to fit the image curvature. Fortunately a family of useful sets of K-corrections and droops corresponding to practical theatre conditions can be realized using only one printer lens focal length, by changing bridge angles, cams and print film "shoes". A change over from one sets of these conditions to another is not very simple, however, because several critical adjustments such as phasing of the cams with the frame line and balancing the focus of the oscillating lens are required to obtain best performance. One other change in the printer lens of the Mark III might be noted. The matching of intrinsic keystone with K-correction requires, in general, a longer focal length printer lens than used in the Mark II and this introduces a new distortion into the printed picture, namely, a horizontal expansion of objects near the edges of the picture (in very much the same way as projection on a curved screen compensates for the barrel distortion in the camera lens). This is a very undesirable effect for scenes taken with long focal length camera lenses since now this horizontal expansion would occur twice, once in the printer and again on the screen. To eliminate this effect in the printer, an aspherical lens similar to the type used in the 128° camera lens was used as one element of the printer lens system (the element nearest to the negative film). This effectively reduces the horizontal magnification for objects near the edges of the picture without changing the vertical magnification and cancels this source of distortion.